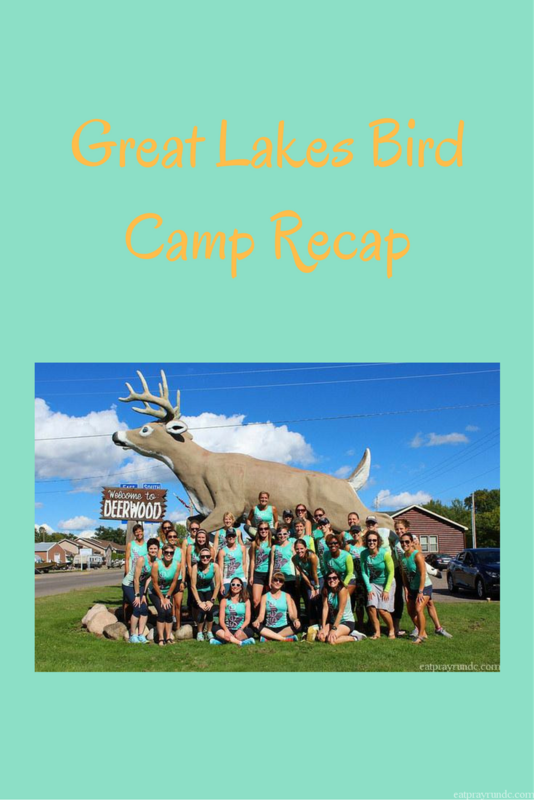 I have been struggling over the past few weeks to write my Great Lakes Bird Camp recap because I just don’t know where to start. But I suppose, as with most things, the beginning is a good place. After I returned from Southern Bird Camp in May, I wanted more. I quickly figured out that I could swing the Fall Great Lakes Bird Camp and that was that. September seemed far away and in the interim, I managed to convince one of my DC Oiselle Team Co-Leaders, Colleen, to come also. The lead up to camp was fun because one of the camp leaders created an awesome FB page for us to use to connect with each other before arriving. So what did we do? Lots, including lots of running, of course. Friday I flew to Minneapolis and met with Laura from Milwaukee and Emily from Chicago. We hung at the airport for a bit, and then it was time for our rides to arrive. We were lucky enough to have a number of birds volunteer to pick us up at the airport and drive us to camp. We had three cars full of teammates and I rode with Amanda and Hyedi (both Twin Cities gals). Once we arrived at camp, we settled into our cabins and then gathered for a short run. Then it was on to our welcome happy hour where we had snacks, drinks and got our swag. It was fun getting to meet so many new to me birds and getting to see a number of birds I met at camp last summer. The rest of the evening consisted of dinner, and two great talks. First, one on nutrition from Minnesota Vikings nutritionist Rasa Troup. Rasa was awesome and convinced me to try eating something light before harder workouts. I tried it out at camp and didn’t have to go while running (always my fear) and felt good, so thanks Rasa! Next we had an awesome talk from Haute Volee teammate and professional runner Anna Weber. Anna talked about how we often place senseless limits and deadlines on our dreams and how she was able to remove those limits and deadlines. It was real and it was inspiring. I loved getting to know Anna over the weekend – and she also blogs so check her out here. We ended the night with a little bonfire action then headed back to our cabins. I was out and slept SO SO well. Saturday we started with breakfast and then some of us tried to do a trail run. I say tried because we couldn’t find the trail. I’m actually not convinced it exists :). We headed back to the road for a few miles and then it was off to the ropes course! 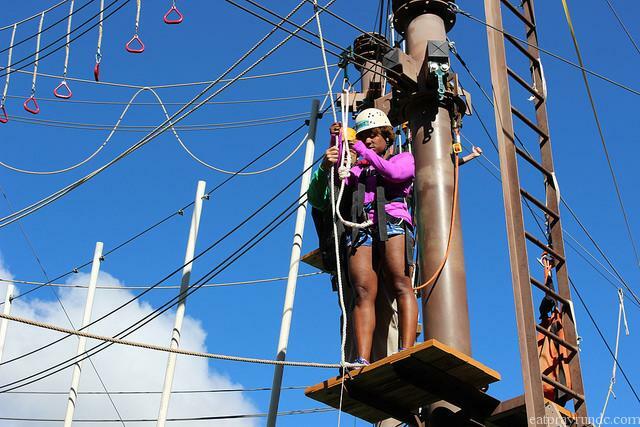 I’ve never actually done a ropes course before and was slightly totally terrified. It was really fun, though and I was glad I did it. I never thought of myself having a fear of heights but once I was up there, my legs were a-shaking! The hardest part was taking the very first step out – that’s what I was pondering in the picture below. But like most things in life, the first step is DEFINITELY the hardest one. We had some time to eat and relax before Amanda kicked our butts in boot camp. It was so good and super fun but a real workout! After boot camp we headed out for mini golf. At this point, I was starting to fade and ended up only playing 8 holes before ditching to sit and gab with some of the gals. Amanda must’ve felt bad after kicking our butts because she offered to drive some of us back to camp while others played human foosball. I chose to head back to camp and take a nap. It was glorious! We ended Saturday with dinner, an awesome trunk show with lots of sneak peaks from the fall Oiselle line and a bit more bonfire / hangout time. I headed to bed relatively early since the long run was coming the next morning. 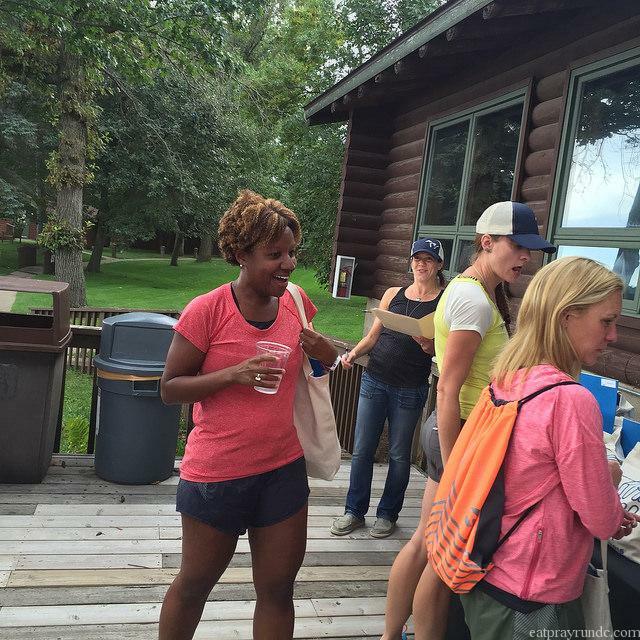 Sunday we headed out to Cuyuna State Park for our long runs. I fell in step with a small group and we did a couple out and backs along gorgeous trails. The weather was PERFECTION. About 60 degrees with absolutely no humidity and gorgeous views. It was a wonderful long run and to top it off we did a little ice bath in the lake to recover after the 16 miles of fun we’d had. 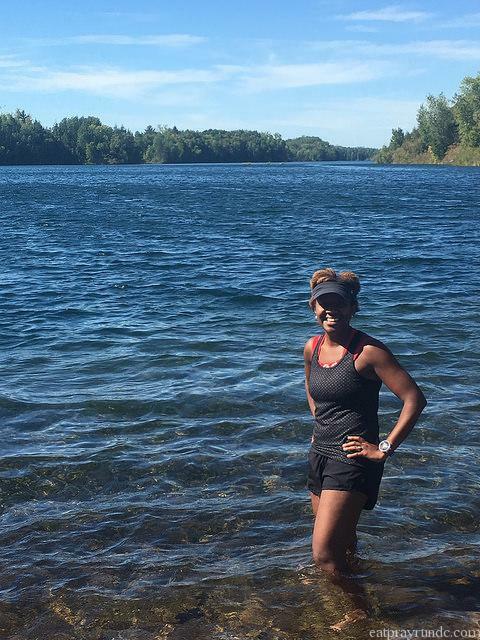 Nothing better than a natural ice bath – the lake was much more relaxing than sitting with 16 pounds of ice in my tub. This was one of my best long runs I’ve had during this training cycle and certainly had the best weather. It was really fun seeing fellow birds along the trail and especially seeing our Haute Volee (Anna and Becki Spellman) fly by (literally. They are incredibly fast). After lunch and showers, Becki led the group in form and core drills. I “supervised” this and then took another nap. I really have gotten dependent on post long run naps and as I knew I wanted to stay up late on Sunday since it was our last night, I knew a nap was a necessity. 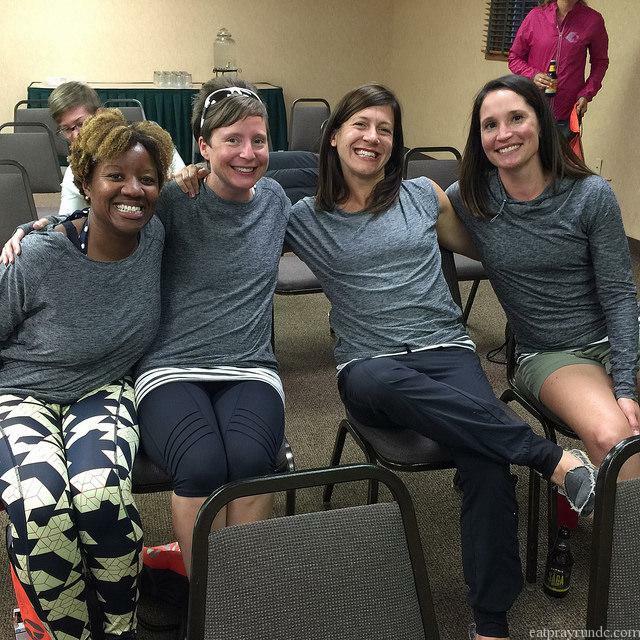 That night we had dinner and then a talk from one of my favorite gals on the team – Erin Ward. I can’t do Erin’s talk justice so I won’t try. But Erin is not only hilarious and smart, she’s open and real and her talk was all of those things. And then…we celebrated. We danced, drank, laughed and talked. I think I stayed up until 12am – kind of a record for this gal! SUCH.FUN. Monday morning brought one more run and then sad goodbyes. Lucky for me, Becki was actually on my flight home so we got to chat for a few more hours, which was awesome. And – shout out to Becki who just WON the Akron Marathon because she’s a boss. Great Lakes Bird Camp did not disappoint. I had such fun and really enjoyed myself. This group of gals were the absolute nicest and I’ve met a whole new crew of teammates (and reconnected with some favorites). I’m grateful I was able to attend and am already looking forward to my next camp (tbd) experience! Looks like so much fun! I wasn’t able to attend my area’s bird camp this year, but I really hope to in 2017. Any time I read a recap it makes me really jealous! I’m so glad you had fun! 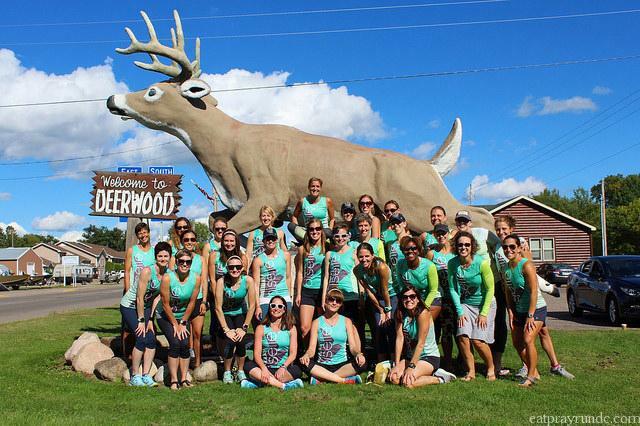 You just might have inspired me to look for a running camp next year. Running in Minnesota is a nice change of pace from DC- often cooler, though not always less humid. Go to Zap in NC!!! Jenn went and loved it as much as I did. It’s amazing! This sounds like such an amazing weekend! I also love how more and more summer camp opportunities are popping up for adults – what a throwback to being a kid. It sounds like you had a fabulous time! I’ve never been to Minnesota, but it sounds lovely – hello low humidity!